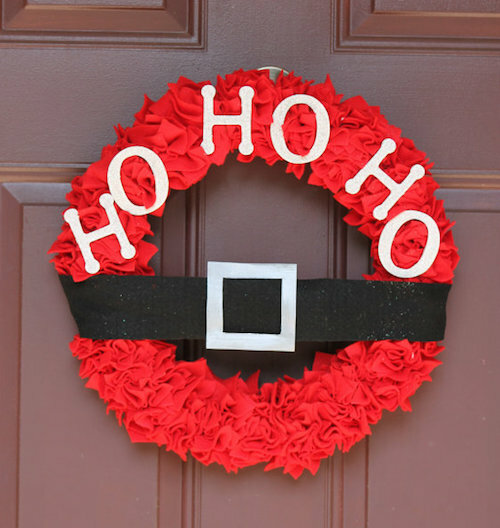 Have you started your Felt Christmas Wreath for the season? We are all familiar with the song that goes “Deck the halls with boughs of holly, Fa la la la la, la la la la…” However, your halls aren’t the only places you should be decking this Christmas. Your front door, windows, mantel, and walls all deserve to be decorated. The perfect décor object for all of these areas is a felt Christmas wreath. 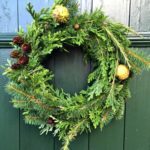 Why is a felt wreath the best décor object? Because it can be used any time of year. 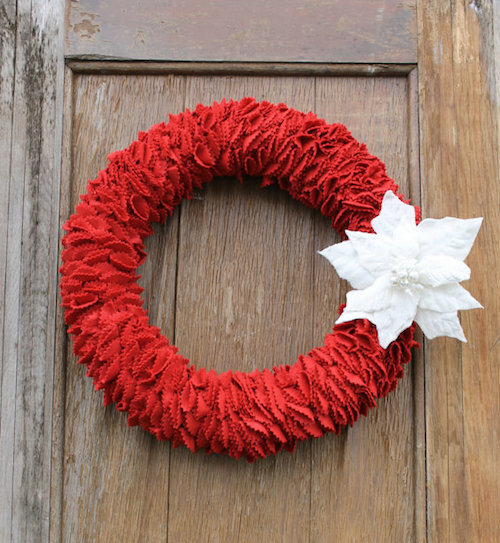 This Santa inspired red felt wreath is perfect for your door! Using the sharpie, trace the can in little circles on the red felt fabric. Use the pinking shears to cut out each of the circles. You can cut rows on the fabric first before cutting single circles. Take one circle and fold it twice to make a quarter shape. 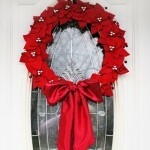 Attach its corner to the foam wreath with a pin. Repeat the same process and attach the second circle next to the previous one. Their corners should align. Attach two more circles and ensure their corners align with those of the previous two circles. The four quarter pieces should form a full circle. Fluff the pieces. 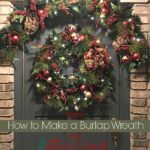 Attach more quarter pieces as you fluff them until you fill the entire wreath. Cut a small piece from the ribbon and attach it to the wreath with hot glue or pins. Paint your letter with acrylic paint and leave it to dry. Affix it to the wreath with hot glue. Display your wreath wherever you want. Nothing spells Christmas like a bright red wreath. If you want to show your love for the season, make this felt Christmas wreath. The best thing about it is that it doesn’t require many supplies. You can also alter it to fit other occasions of the year like the Fourth of July or Valentine’s Day. 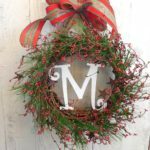 For more Christmas wreaths click here. « Week 1 – Enter to Win In Our Holiday Entertaining #Giveaways! These are amazing! I love that they are so simple, but so nice and really bring out the fun of the Holidays! I think I will try my hand at making one! This looks great and your tutorial is so easy to follow. Thanks for showing us!